Wat Preah Keo Morokat Wat Preah Keo Morokat is also known as the ‘Silver Pagoda’ the ‘Temple of the Emerald Buddha.’ It is known as the 'Silver Pagoda' for the 5329 silver tiles that cover the floor. Each tile was handcrafted and weighs 1.125kg. The vihear serves less as a functioning temple than a repository for cultural and religious treasures, containing over 1650 precious objects. The primary Buddha, sitting on a gilded dais above all others in the temple, is the Emerald Buddha, reported by different sources to be made of emerald or baccarat crystal. In front of the Emerald Buddha stands Buddha Maitreya (Buddha of the Future,) a 90 kg golden standing Buddha encrusted with 2086 diamonds including a 25 caret diamond in the crown and a 20 caret diamond embedded in the chest. Other objects include a Buddha relic from Sri Lanka in a small gold and silver stupa, a collection of gifts from Queen Kossomak Nearyrith, and contributions and gifts from other nobles and Royals. Ramayana Frescoes The interior of the pagoda compound walls is covered with murals depicting stories from the Reamker, i.e. 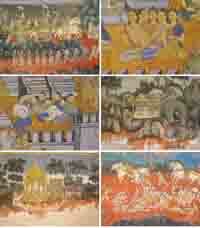 the Khmer version of the classic Indian epic, the Ramayana. Some sections of the murals are deteriorated and weather damaged. The murals were painted in 1903-1904 by a team of students working under the direction of artist Vichitre Chea and architect Oknha Tep Nimit Thneak. In the 30s the galleries served as ad hoc classrooms for Buddhist monks. 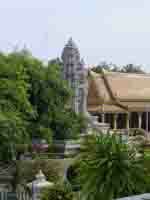 Keong Preah Bath Shrine containing Buddha footprints. Fortune tellers. Library Small library next to the main vihear that houses sacred Buddhist texts (Buddha's Tripitaka, i.e. "Three Baskets") and also contains an image of a sacred bull named Nandin, and several Buddha statues. The Nandin statue is metal (primarily silver) and is said to be of ancient origin. 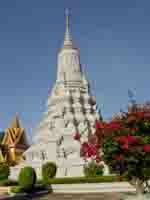 The statue was found in Kandal province in 1983. Fortune tellers work inside the shrine. If you can find somebody to translate for you, you can have your future told for a small contribution. Phnom Mondop Phnom Mondop is a small artificial hill symbolizing Mount Kailassa, topped by a shrine containing a large Buddha footprint. The shrine is adorned with 108 Buddha images symbolizing the 108 past lives of Buddha. Fortune tellers work inside the shrine. 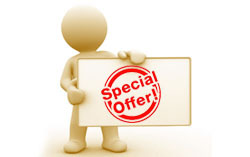 If you can find somebody to translate for you, you can have your future told for a small contribution. Statue of HM King Norodom Equestrian statue of the King Norodom (1834-1904). Completed by French artist Eude in 1875 in Paris and placed on the pagoda grounds in 1892. 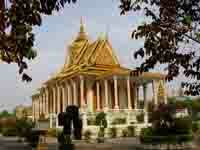 The canopy was added by King Sihanouk in 1953 to honor King Norodom in light of Cambodia's new independence. 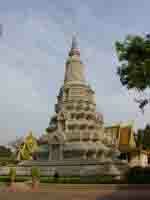 The stupa north of the statue contains the ashes of King Norodom. Stupa of HM King Ang Doung Stupa containing the ashes of the King Ang Doung (1845-1860), founder of the current dynasty and the great-great-great grandfather to King Sihamoni. Constructed in 1908. 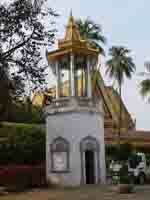 Stupa of HM King Norodom Stupa containing the ashes of the King Norodom (1834-1904). Constructed in 1908..
Stupa of HM King Suramarit and HM Queen Kossomak Stupa of the father and mother of former King Sihanouk (r: 1955-1960), grandfather and grandmother to King Sihamoni. 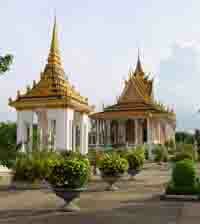 Stupa of Princess Kantha Bopha The memorial sanctuary of the beloved daughter of the former King Sihanouk. Princess Kantha Bopha passed in 1952 at the age of four, succumbing to leukemia. 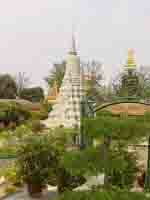 The stupa was built in 1960. Belfry The bell is used to signal the opening and closing of the temple and for ceremonies.